Wing Keelan Giles hopes to make his Wales debut soon, having missed out on initial Six Nations selection through injury. Giles suffered a hamstring strain for his region in a European Challenge Cup win over Lyon in January. The Osprey was an unused replacement when Wales beat Japan in November. "The intensity in training and the accuracy you need was a bit of a step up, but it was a good experience for me," he told BBC Wales Sport. "It's a dream for every young boy [to play for Wales] so if it comes it comes and if it doesn't I'll have to work harder, but hopefully that time will come pretty soon." 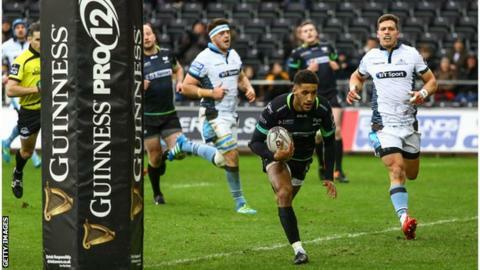 Giles has scored 12 tries in 11 matches for Ospreys in his first full season with the region's first team. "As a winger you like to get on the end of passes and do some magic," he said. "It's been a good first pro season and I'm totally enjoying it and I hope there's more to come. "It's obviously something I didn't really expect, but it's been nice to gel in with the team and be playing and I hope there's many more seasons to come. "We play an expansive game which suits me to get the ball more and more in my hands and with the results we're getting it's working for us." Giles returned from injury in the 25-23 Pro12 defeat by Munster in February and scored in the bonus-point win over Glasgow the following week. "I'm feeling good and the hamstring's good now and it's just a case of keeping on top of rehab now so I'm raring to go. "It's obviously good to be back up and running and injury free and hopefully I'll get a few consistent games now and get a good run of games. "If it [a Wales call-up] comes it comes, but my main focus is playing well for the Ospreys and seeing the season out," Giles added. His Ospreys predecessor Shane Williams is among those to have backed Giles winning international honours early in his career. "I've got the same physical attributes [as Shane Williams] and I was watching him scoring tries for the Ospreys and Wales growing up, so he's definitely a role model of mine."